The triple stage water filter consists of three distinct stages; the first comprising of a Sediment filter that removes dust, dirt algae etc (actually mostly visible things), the second one is a Carbon filter that gets rid of bad odour, chemicals, pesticides etc, and the third stage has a Ultra-Violet lamp that is supposed to kill bacteria and thus further purify the water. Theoretically the three stage filter should have sufficed but practically there were a few problems which I found after using the filter. The first being that the sub-surface water in my area is very dusty and would turn the Sediment filter to dark brown in a matter of days. The second was that Carbon filters being sold in the market are mostly fake!!! Yes, you can tell the difference only by opening it up which renders it useless. A carbon filter basically has small particles of black color, but the con men in the market are making devices which look like a carbon filter but is actually a similar looking thing made of cement!!! And third the Ultra Violet lamp in most cases does not work. So the first lesson is to go for a reliable source for buying a filter. And please try to understand expensive doesn’t mean reliable at all. A trip to a few shops will make it clear. These things sorted out, I installed the filter but this again did not solve the problem number 1; that is the sediment filter would turn brown in a week’s time. Obviously a solution had to be found to this all. 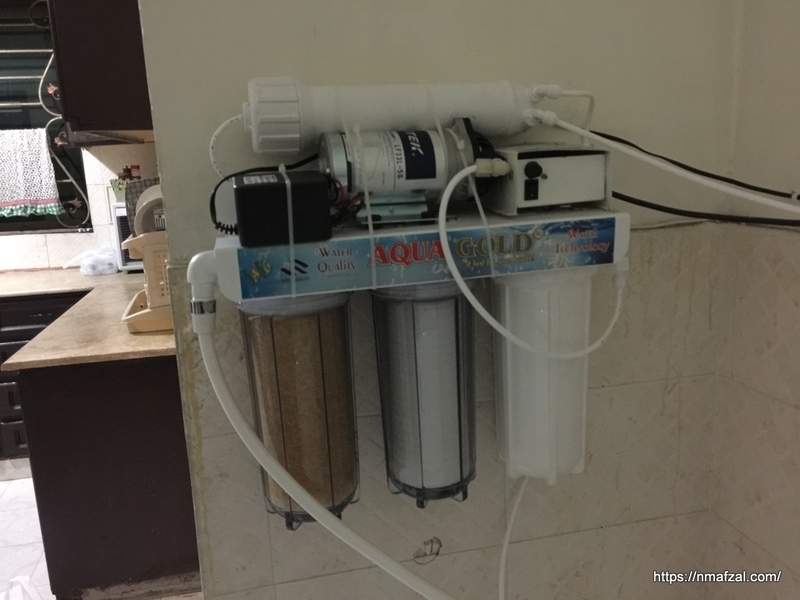 More Googling and research took me to the option of installing an home Reverse Osmosis (RO) water filter. These things are expensive as compared to normal tripe stage water filters, starting from Rs 20,000 and going till around Rs. 80,000. 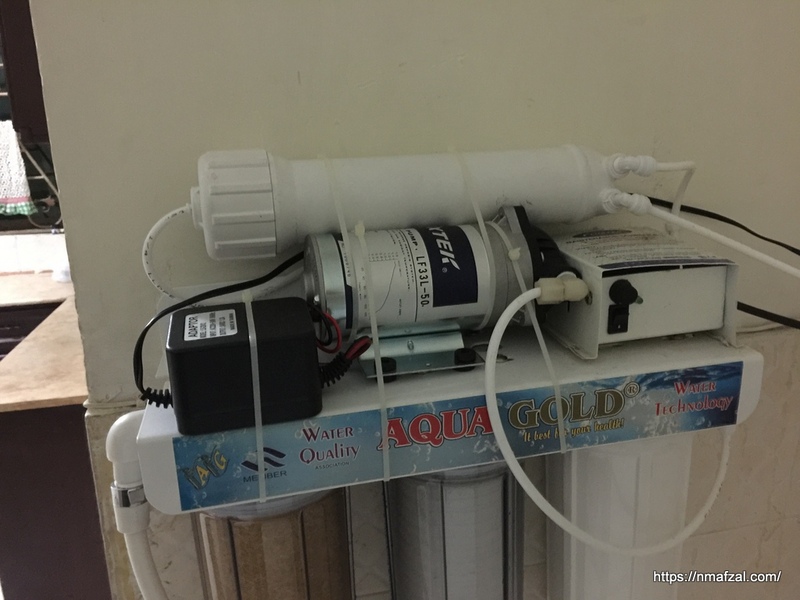 But to understand it basically a home RO filter is a normal triple stage filter with a small motor and a casing having an RO membrane for purifying the water to almost mineral water level, or so they claim. So more research and I found a solution which would give me pure drinkable water using my triple stage filter and converting it to an RO. The first thing I did was that I installed two Sediment filters, in the first and second stages. The first one filters sediment and gives added protection to the second stage, at the same time it protects the RO membrane, else I would have had to replace the membrane very frequently. The Carbon filter was taken out and installed in the third stage. How? Well in most cases the UV lamp is housed in a tube and the Carbon filter is hollow from inside, so its can easily be fitted in the third stage. Next the RO motor and membrane along with its casing was installed. I used a 100 GPD membrane which far exceeds my use but is a good option. Normal home based RO plants are automatic, having a small tank of about 25~50 litres attached to it which fills up automatically and the RO then shuts down. This in my case was not workable since 24/7 electricity is not guaranteed in my area. So I had to get a manual setup which I did. As you can see in the photo above and below my triple stage has two sediment filters and the third stage houses the carbon filter. After some use I was getting acceptable level of TDS (less then 500) which means very good level of water purity. But in order to further substantiate my results I paid a visit to the Pakistan Council of Research in Water Resources based in Islamabad. The very helpful staff gave me three bottles for testing my water at home without bringing the sample to their lab. Two samples of water, one from the tap and the other from the RO filter were deftly filled and placed for 48 hours. The test is very basic in nature, if the water after 48 hours turns black it means its not drinkable and if it is brown it means its drinkable. 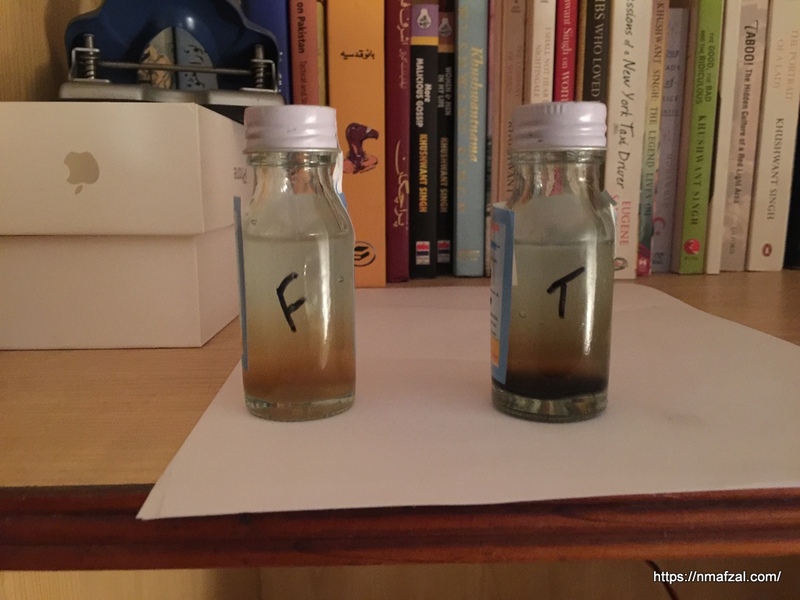 After 48 hours the filtered water was brown and hence drinkable whereas the tap water was black and hence deemed undrinkable. “F” for filtered water and “T” for tap water. PreviousNo loan till Kashmir is freed!